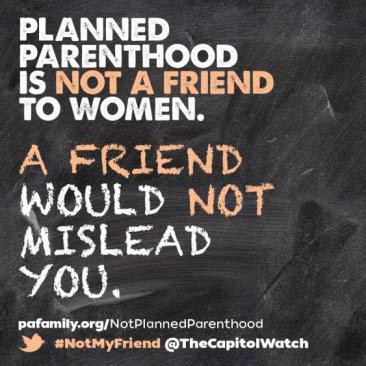 Planned Parenthood is not a friend to women. Planned Parenthood is big business. Planned Parenthood = Abortion. No matter what. 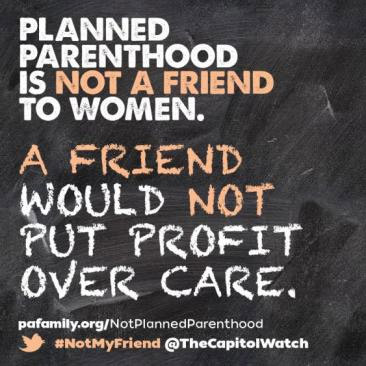 A friend would not put profit over care. Planned Parenthood receives $1.5 million per day in public funding; $540.6 million in taxpayer funding last year alone (almost half of their total revenue). Planned Parenthood made $58.2 million last year and $383 million in profits over the last 5 reporting cycles1. All this for the largest abortion provider in the country. Planned Parenthood employees, such as former clinic director Abby Johnson, were given an “abortion quota” to heighten the number of abortions so as to bring in more revenue. Former nurses described Planned Parenthood as a “meat-market style of assembly-line abortions.” Another former PP nurse said employees were threatened with less work hours if abortions were down. 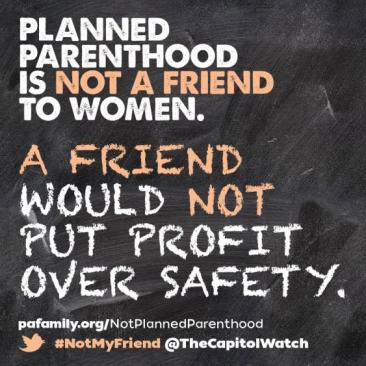 A friend would not put profit over safety. Pennsylvania affiliates of Planned Parenthood said it would be “dangerous,” “unnecessary” and “burdensome”2 to make their clinics follow the same measures as every other surgical center and to be routinely inspected (following the Kermit Gosnell case, it was revealed that PA abortion clinics had not been inspected for decades). Planned Parenthood Southeastern PA CEO Dayle Steinberg said these safety measures would be “so expensive, they’d have to shut down.” This from an organization that was boasting $6.5 million in public funding given to Pennsylvania affiliates that year3. And an organization nationally boasting profits of $58.2 million last year alone. And even after the law was implemented, Planned Parenthood Southeastern Pennsylvania not only remains open but operates in the black4. 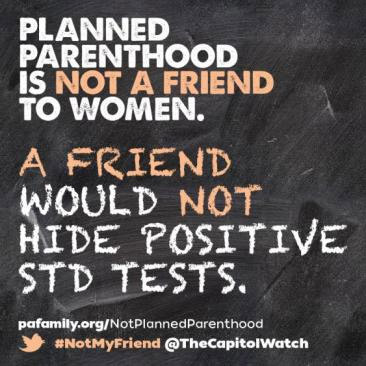 A friend would not hide positive STD tests. Planned Parenthood nurses reported that STD testing were not being reported in a timely manner – some over a year. Some were never informed at all. A friend would not mislead you. Their income totaled $3.673 billion (with a “b”). You — and every taxpayer — helped give them $1.621 billion (again, with a “b”) in government funding. And their profit equaled $301.1 million. Across America, breast cancer services at Planned Parenthood are down 39%6. Their prenatal services are down over 50% 7. And not one mammogram is provided in their clinics. However, Planned Parenthood abortions are at an all-time high – steadily over 327,000 each year 8. 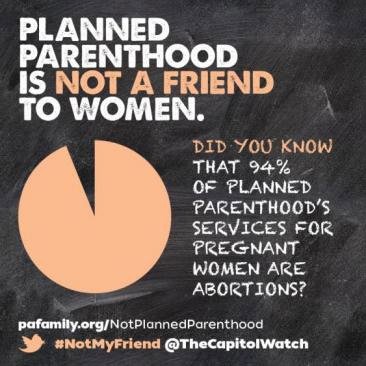 94% of Planned Parenthood’s services for pregnant women are abortions 9. 64% of all induced abortions in PA are performed by Planned Parenthood 10. 1 PPFA Annual Report, 2012-2013. 2 Facebook pages and website for various Planned Parenthood PA regional affiliates. 3 Planned Parenthood Regional Annual Reports, Newsletters (2011). 4 Planned Parenthood Southeastern PA Annual Report (2013). 5 The Joy Behar Show: Planned Parenthood Changing Plans? (HLN Feb. 21, 2011). 6 According to annual reports, cancer screenings performed by Planned Parenthood: 1,830,811 in 2009, 1,307,570 in 2011, and 1,121,580 in 2012. 7 According to annual reports, prenatal services performed by Planned Parenthood: 40,489 in 2009, 31,098 in 2010, 28,674 in 2011, and 19,506 in 2012. 8 According to annual reports, abortions performed by Planned Parenthood: 332,278 in 2009, 329,445 in 2010, 333,964 in 2011, and 327,166 in 2012. 9 PPFA Annual Report, 2012-2013, p. 15 — Pregnancy Services: 93.8% abortion, 5.6% prenatal care, 0.6% adoption referral. 10 Department of Health: Abortions — Quarterly Facilities Report, 2012.